Firefighters have used cutting gear to free a man from a car found crashed on its roof on a road in the Highlands. The emergency services were alerted to the accident on the A862 Inverness to Beauly road between Clachnharry and Inchmore at about 13:30. 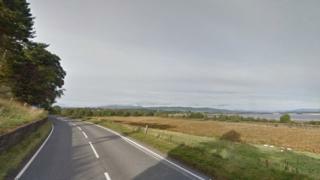 The Scottish Fire and Rescue Service sent four appliances, including a heavy lift vehicle, from Inverness to the scene. The extent of the man's injuries are not known at this stage.